How can artists make sailboats appear to be travelling quickly in the wind? 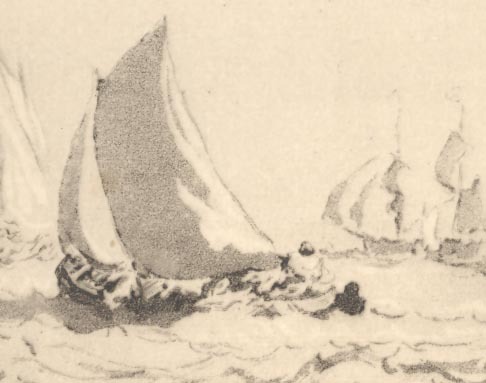 One of the best ways to represent movement of sailing boat on the ocean is to portray the sails as being buffeted by a breeze blowing from the left (as opposed to being blown from the right as shown in the print below). The reason for this is to do with the direction Westerners read—from the left to the right. If an artist wants a subject to appear to travel quickly then the subject should face the direction of the reading’s flow. 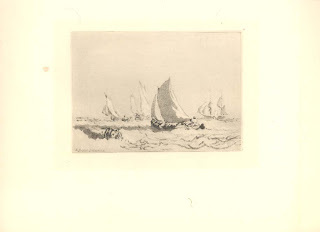 Although this information may seem to be at odds with the portrayal of sailing boats in Brunet-Debaines’ delicate etching and acquaint there is a simple explanation for this anomaly. Both Turner and Brunet-Debaines drew their images as a mirror image to the one showing in the print. This is a critical principle that all printmakers need to consider: a printed image is the mirror image of the artist’s line work on the printing plate. Condition: Crisp impression with spot stain outside the plate mark on the left (see below) but otherwise in a pristine condition. I am selling this print for $30 AUD including postage and handling to anywhere in the world. If you’re interested in purchasing this print please click the email button at the top of the page or the "Buy Now" button below. Compare the image above (the printed image) with the mirror image below (the way that Turner and Brunet-Debaines executed their drawings) to see the difference in the perception of speed. 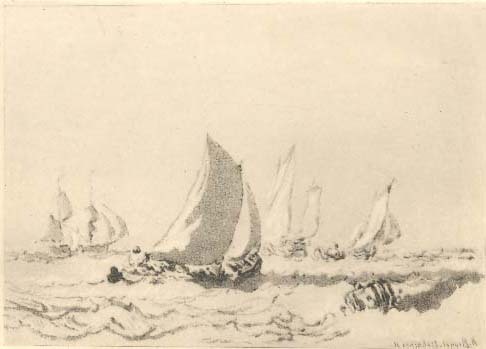 Although the mirror image with the sailboats facing to the right may appear to give the boats extra speed, the composition of the printed image with the boats facing to the left does have a positive attribute: the arrangement slows a viewer’s left-to-right reading and helps constrain the rhythms of the composition from sliding out to the right. It also suggests that the boats are struggling against a heavy wind. 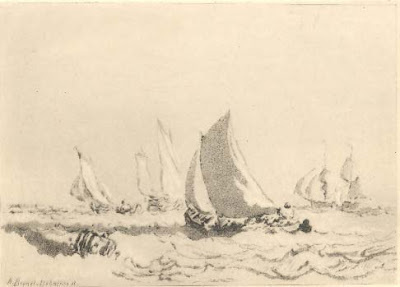 Beyond the discussion concerning the direction the sailboats face, there is another interesting principle for portraying speed in this print. 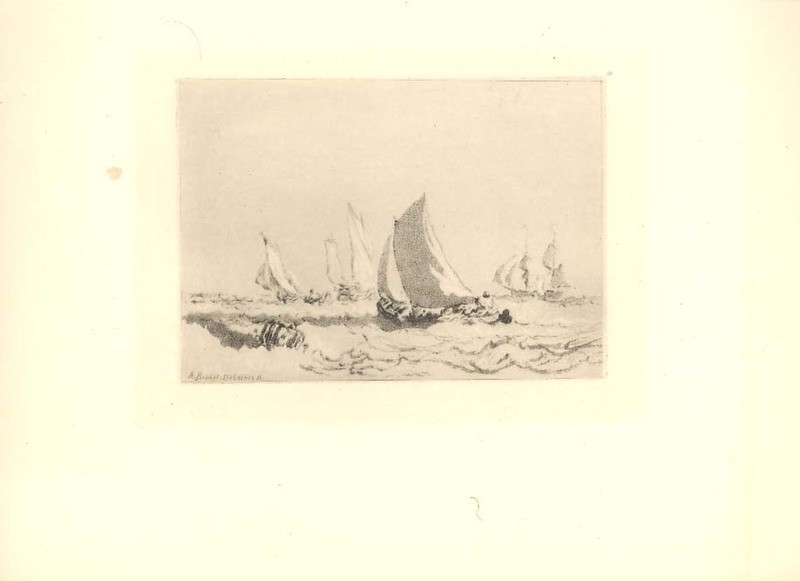 This principle is to leave “empty” pictorial space behind the sailboats (see detail below) and to ensure that there is background subject material featured front of the sailboat. Arguably, the reverse is also true in that movement may also be connoted by using a background that is “empty” in front of the sailboat and “full” of featured subject material behind the boat. There are many principles that artists use to express movement. I will discuss more of them in the near future.